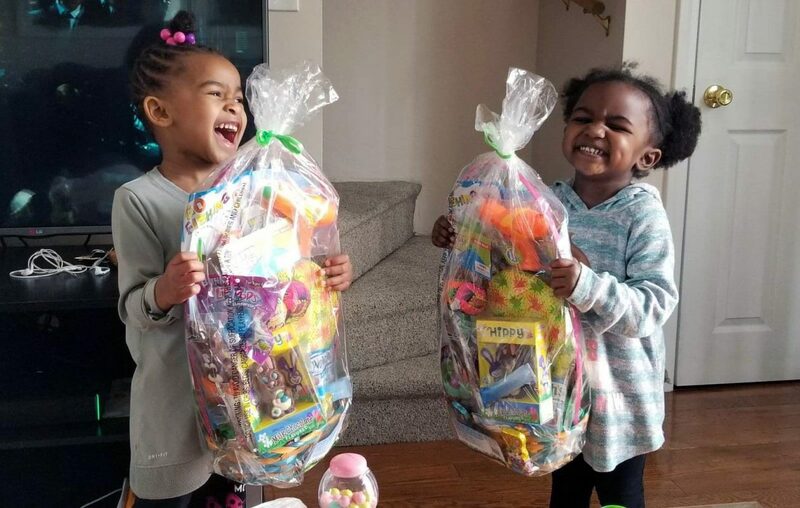 Mercedes Wilson’s 4-year-old twins look forward to their Easter baskets, while her older children appreciate the gift cards. Peter Cottontail has been hoppin’ down bunny trails across America since the 1700s–a tradition believed to have been brought over from Germany, where children made nests for Osterhase the storied hare to lay its colored eggs in. Over the years, simple nests have been traded in for fancy baskets and mountains of chocolate bunnies, jellybeans, plush toys, games and other surprises. Here’s what some notable Western New Yorkers say their kids find in their baskets Easter morning. This year, the family will once again decorate the dining room table with grass, jelly beans and chocolate bunnies—a tradition they had to take a break from when the twins were younger and would destroy the scene, strewing grass everywhere. “The kids are supposed to wait until Easter, but they sneak and that’s what makes it fun. The goal is to not get caught eating the jellybeans,” said Wilson. This entrepreneur extraordinaire clearly has a lot of offerings to help the Easter bunny out—from standards like chocolate eggs, bunnies, truffles and chocolate-covered Peeps to “geek” chocolate molds in the shape of Star Wars characters and superheroes. His own son, age 3, typically gets a basket filled with his favorite character du jour, along with toys, flash cards and comics. According to a quick, unscientific poll among mothers, one of the most popular deliveries from the Easter bunny is a gift card to Platter’s Chocolates in North Tonawanda. It makes for a perfect “mom and me” day and one of Platter’s famous milkshakes (orange chocolate is a clear favorite). Other recommended stops for the Easter bunny: Ko-Ed Candies on Abbott for sponge candy and Vidler’s in East Aurora for wind-up chicks and other trinkets. A pre-Easter trip to Broadway Market was also high on the list, specifically in search of butter lambs, pierogis and Dyngus Day T-shirts. Evidence of the Easter bunny for his two sets of twins, ages 7 and 11, includes rabbit footprints coming through the door and chewed up carrots spit around the house. Basket candy includes chocolate molds of things the Easter bunny knows each kid is into, like boxing gloves, guitars and cell phones for the older kids, and dinosaurs and monster trucks for the younger ones. But the pièce de résistance is a gigantic chocolate bunny—retailing for around $300—that gets left in the middle of the showpiece Easter village the family sets up in advance.